← Eastern Suburbs Review: Well, Hello, Sailor’s Club! Sauce looks good – based on a reduction of stock made with the langoustine shells? Steve at the pub, I worked in a club restaurant back in the late 70’s. 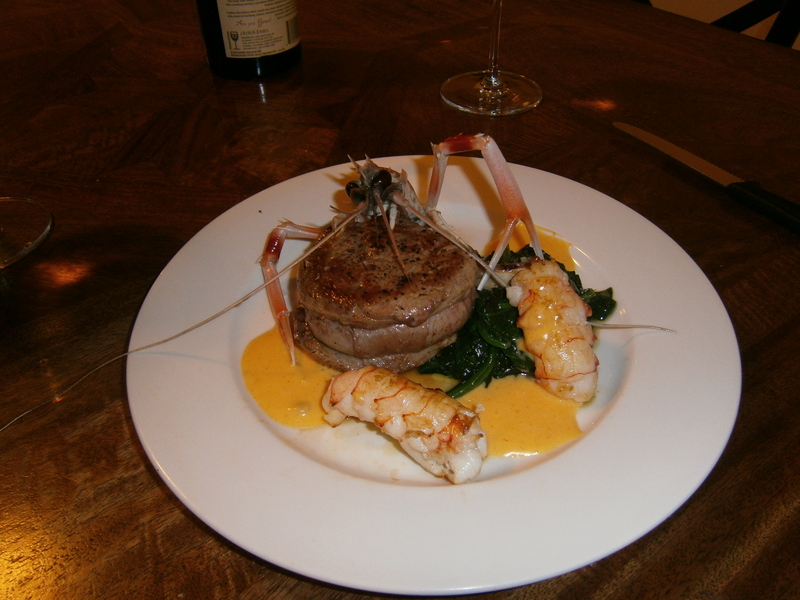 A surf and turf was about 400g of filet steak (a big thick peice butterflied and wrapped with bacon) and half a crayfish tail, both smothered with bernaise sauce. Shame the cray was cooked frozen Tasmanian with little flavor. The bernaise was a wonder – made with clarified butter and thick enough to go under the salamander to get a bit of colour. Don’t know how they did it so it would not break. Personally, I’ve never been much of a fan of surf and turf, but a proper chicken marengo (with little crayfish tails) is a decent enough dish, and all those variations of pork belly or black pudding with scallops are just fine. Er… Dr. Duck. It is the terminology that was my subject! “Surf n Turf” is in the same basked as greeting someone with “Hi Guys”, or with men drinking a white spirit. The dish is a regular, though never before, until this post by PWAF – and your comment just now – have I seen it done with shellfish. Quaint foreign customs… etc etc etc… We’ll now give it a try, though I’ll never be able to bring myself to use the phrase “Surf n Turf”. Not after a having established a reputation for more or less running people out of town for using it!